As Barbadians continue to prepare and brace for the passing of unpredictable Atlantic weather systems, the Barbados Defence Force (BDF) continues to plan, train and coordinate. This ensures the capability and capacity to assist interagency partners in responding to any worst-case scenarios which may emanate. The Force has a multidimensional role in local and regional disaster response. The training and preparation of the BDF were recently tested during the passage of Tropical Storm Kirk (TS Kirk). The BDF rescued 15 persons (including a pregnant lady, 2 children and 3 senior citizens). BDF personnel also conducted damage assessment, reconnaissance tasks and debris clearances. 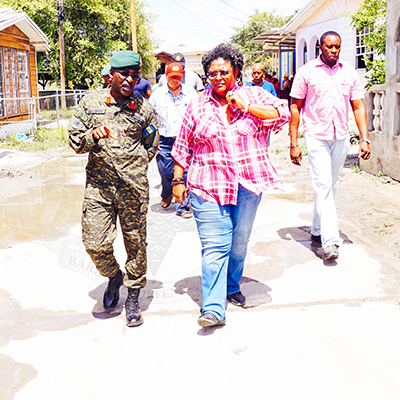 Prime Minister, the Honourable Mia A Mottley Q.C, M.P and Chief of Staff Colonel Glyne Grannum touring the severly flood affected areas due to the passage of Tropical Storm Kirk.